A View to a Kill was Roger Moore’s last film playing the role of Bond, and it’s a memorable one to go out on. Not necessarily completely good, but memorable. The starts off with a good opening sequence with Bond in Siberia investigating an Agents death, and then being chased by the Russians. This scene is topped of the a superbly campy moment of Bond water skiing on to the sound of ‘California Dreams’ by the Beach Boys. This moment should be bad, but I found it to be a fun, albeit campy moment, a staple of the Moore era Bond films. This whole scene is pretty cool, up until the mechanical iceberg that is. Bond escapes in an iceberg boat thing, and it’s too silly even for me. It looks fake and his beautiful accomplice sits inside, waiting for Bond. Who is this woman? I don’t know, but the who cares because then the awesome Duran Duran theme song starts and all is forgotten. After MI6 find out that their super secret microchip plans are being copied by the KGB, Bond is instructed to infiltrate the microchip manufacturers, Zorin Industries, and find out who’s leaking the plans. Bonds search starts and his mission takes him from Ascot Racecourse to the Eiffel tower, to Zorin’s horse estate and then to San Francisco where Zorin plans to flood Silicone Valley so his chips are the only ones left in the world. The plot of AVTAK is an odd one, it’s quite a bit stupid but it’s vastly elevated by the performance of Max Zorin played by Christopher Walken. In fact the whole film is elevated by his performance, and he soon becomes the best part of the film, and one of my personal favourite villains in the history of Bond. Zorin’s backstory is as weird and unique as Walken’s performance as well. He was a Nazi experimental super baby, with the only side effect to his extreme genius being he will be a psychopath. He is aided by the evil Nazi doctor who created him, Dr. Carl Mortner, a Josef Mengele-type evil Nazi scientist played ably by Willoughby Gray. Zorin is also helped by his henchwoman May Day played with suitable menace by Grace Jones. May Day is an awesome villain and is perfectly matched to Zorin. I’d rather come face-to-face with Jaws in a dark alley as opposed to Grace Jones’ May Day, she is genuinely scary. Another good performance is Patrick Macnee as Sir Godfrey Tibbett, an MI6 agent and horse trainer. His back and forth with Bond is fun and I was actually sad when he was killed off. A weaker link in the performances would have to be the dismal Bond girl Stacey Sutton, played by Tanya Roberts. She must be one of the worst Bond girls in the entire series, all she does is get put in danger or scream. She is not good at all, and is actually quite annoying. Moore tries his best as Bond, but he does look his age by this point, he even celebrated his 57th birthday on set. He does a reasonably good job though, but it is awkward when a near 60-year-old Moore is flirting with a 19-year-old Alison Doody, who plays Jenny Flex. The film has some good action in it which makes up for the flaws. The standout moment for me would have to be the fight between Bond and Zorin atop the Golden Gate bridge. There is just something so awesome about it, and it is my favourite scene in the movie, and it is again elevated by the insane villain Zorin. There is also a pretty awesome firetruck chase, and while it is slightly pedestrian, looking more like a 70’s cop show than Bond, and is over rather quickly it is still quite cool. The John Barry theme to AVTAK is as strong as ever, and it makes the already awesome finale so much better. 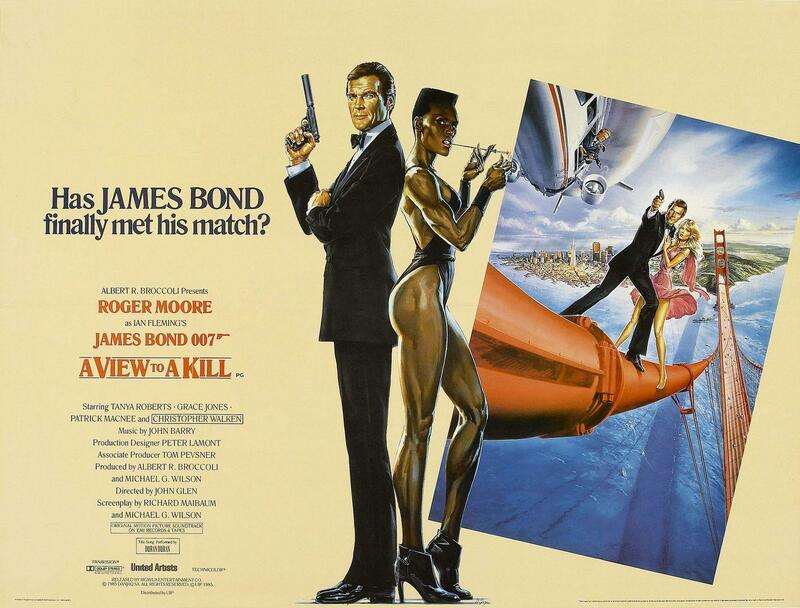 The Bottom Line: A View to a Kill is an odd Bond film. When looked at in parts, it shouldn’t be good. And it kinda’ isn’t, but I can’t help but love it. It has one of the best Bond villains of all time in Christopher Walken’s insane Max Zorin, and one of the best theme’s and theme songs, and some awesome set pieces and action. It isn’t Moore’s strongest and it contains perhaps the worst Bond girl of all time, but it is still a very entertaining movie, and a must watch for Walken and the finale alone.